The Annual Dinner, BRNC in 2015, Hornet in 2016 and HMS EXCELLENT Senior Rates Mess last year, proved to be an extremely convivial social events and were unanimously given a big 'thumbs up' by all those who attended. 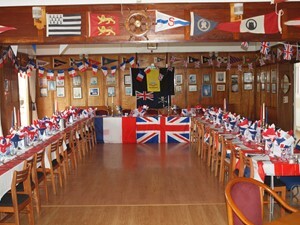 All RNSA members and their guests are very welcome and we have room for 80 people. So if you would like to attend, please secure your place(s) by contacting Central Office/Jon Glass at - moorings@rnsa.org.uk, and submitting payment either via BACS to RNSA; sort code 56-00-64; account number 03307921 or Cheque made payable to RNSA with SURNAME+DINNER 2018 as the reference. There are still places up for grabs this year SO come along to HSSC for a three course dinner (NOT the Wednesday night post race curries, popular though they are!) including a welcome drink, round of port and coffee all for £25. Cash bar for all other libations. Even a Guest Speaker to entertain and stimulate! Rig: Smart Casual. Desert - Trio Berry Amore - layers of Strawberry, Raspberry & Blackberry mouse or Cheese & Biscuits as an alternative if ordered. Please advise early (with booking) if any food allergies or intolerance would necessitate an alternative to the above.